This figure shows restoration of original images from blurred images by applying various deconvolution techniques. Photographs of people's faces on television hidden by little squares can be thought of as examples for degraded images. 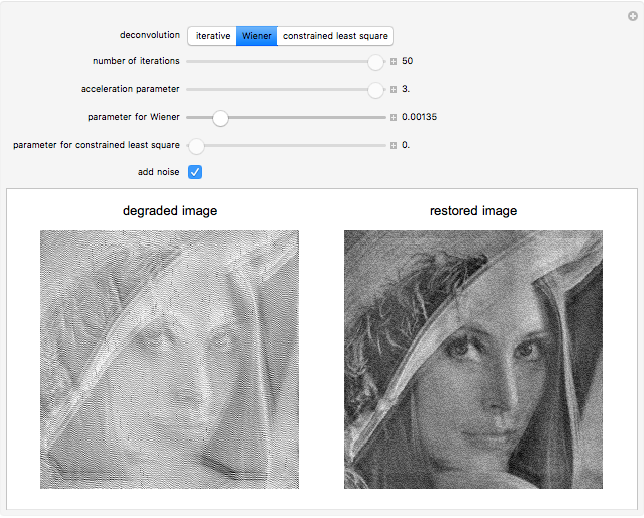 Vary the controls to the optimum to see an interactive restoration of the pristine image from the degraded image. 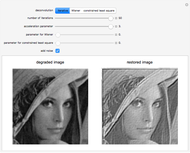 Mathematically, a linearly degraded (blurred) image is defined as the convolution of the pristine image with a kernel function with additive noise, i.e., where is the original noise-free, blur-free image, is the blurred image, is the kernel function, is the noise term, and stands for two-dimensional convolution. 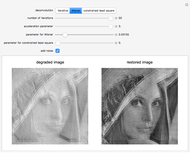 The problem is to find a best estimate of from the noisy blurred data when is unknown in many cases. S. Kawata and Y. Ichioka, "Iterative Image Restoration for Linearly Degraded Images. I. Basis," Journal of Optical Society of America, 70(6), 1980 pp. 762-768. R. C. Gonzalez and R. E. Woods, Digital Image Processing, Addison-Wesley, 1993. 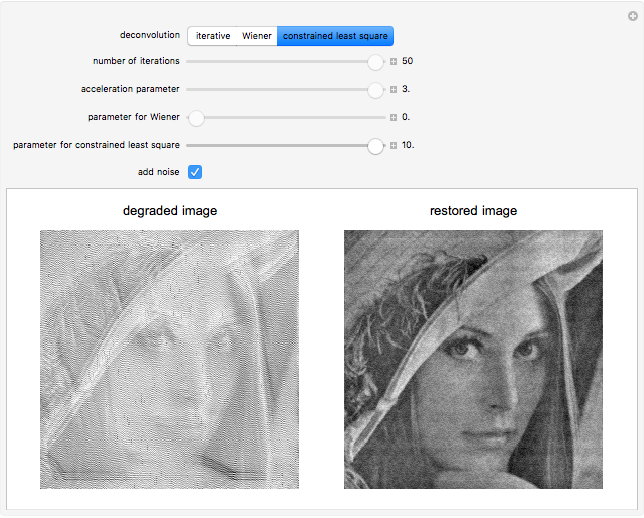 Siva Perla "Image Restoration for Degraded Images"